There was quite a lot of squeaking with delight on arrival in our rooms at La Caleta Bay, which is usually a clear signal that expectations have been reached and breached. We had booked a Family Quad, ideal for a small family, which consists of two adjoining double rooms (or twins depending on sleeping requirements), one with an ensuite shower room. *Book the Family Quad on the ground floor and you have the use of a little patio where you can relax outside with your family. *If you are booking a romantic trip check out the Junior Suites, that come with sea view and front balcony. For me the charm of La Caleta Bay is in all the little details. 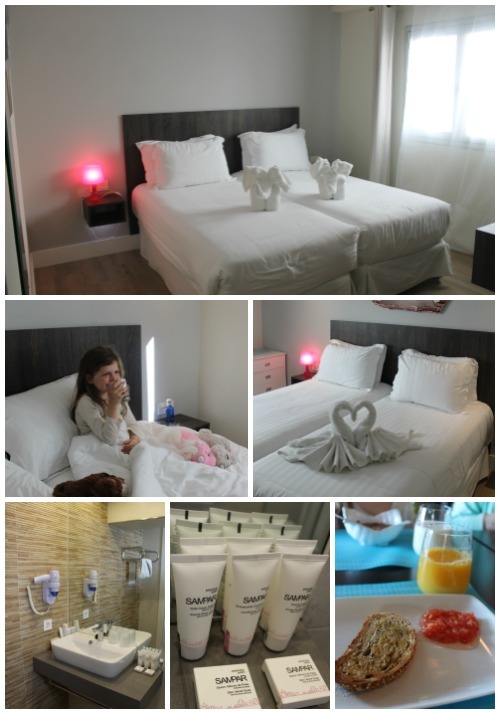 The rooms are bright and contemporary, and of course spotlessly clean, but it was all the small touches that made the experience a little bit special including: sculpted elephant and swan bath towels (or is it towel origami? ), free mini-bar (Cava, juice, water, chocolate), lots of lovely bathroom goodies, pink bedside lamps, and great lighting in general. We also enjoyed the looking at all the prints of Warhol, Matisse and Picasso hung along the corridor to our rooms. The beds were fantastic and are deserving of a paragraph all to themselves. Beautiful white cotton ‘hotel sheets’ (you know the kind) and fluffy quilts, on top of thick cushiony mattresses fit for princesses (and peas) like ourselves. 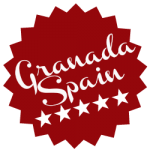 I was in a twin with Little Miss Go Granada Spain and actually enjoyed the feeling of being tucked back into a single bed for once. A dreamy night’s sleep was had by all. Beyond the bedroom we also enjoyed the complimentary drinks and snacks available throughout the day and evening in the lobby. You can help yourself to pastries, freshly ground coffee and hot chocolate, from the machine, as well as a good selection of teas. They also thoughtfully had some white wine and Cava on ice alongside a nice bottle of red. You know they had me at Cava. You are welcome to take a drink to your room or go and watch the world go by and the sun go down on the front terrace. This was great for me in the morning as I didn’t have to ‘hang-out’ for that first proper cup of coffee until everyone was ready for breakfast. Instead I could nip down first thing to collect hot drinks for everyone to enjoy in bed. The hotel restaurant, which shares the front terrace with another restaurant and is accessed from the street, is The Lemon Grass Bar & Kitchen. It offers Sushi, Japanese cuisine and a selection of international options with a 10% discount for hotel guests. The Lemon Grass also serves an international-style guest breakfast buffet, of which we took full advantage. There is another restaurant, Bola Marina La Caleta, that shares the terrace with La Caleta Bay (but not linked with them) where hotel guests can also enjoy a discount on their bill. We didn’t have dinner in the hotel only because we have a favourite pizza place at La Herradura (only a few doors down) that we wanted to revisit. Family Friendly? Or Romantic Getaway? This hotel, which is situated right on the beach, is a good choice for a small family (4 people) if you book one of their two Family Quads, as we did, as there is not the capacity for extra beds in the rooms. The staff were very welcoming and helpful, especially Rosa on reception. They also offer a room off the lobby for storage of your beach gear so that you don’t have to have it cluttering-up your room. La Caleta Bay would also be a fantastic hotel for a romantic weekend or week away, especially if you booked one of the fabulous Junior Suites, which have balconies overlooking the beach. The general vibe is relaxed and friendly, and all the little extra hospitality touches are very conducive to simply kicking-back and enjoying the beach life. We love La Herradura. For me it’s one of the best beaches on the Costa Tropical and I have spent a lot of time there with family and friends. It’s also very popular with the locals, which is always a good sign. 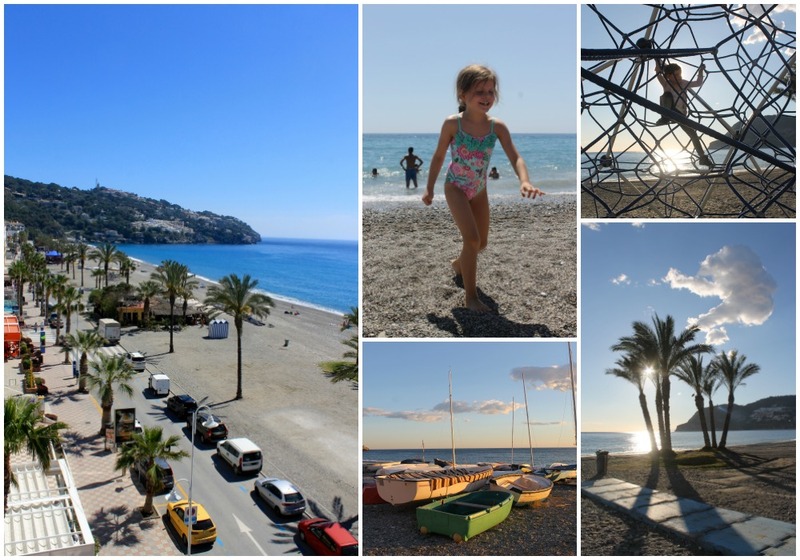 Sheltered La Herradura bay, so named after its horseshoe shape, is the place to go for water sports and also boasts and variety of restaurants and shops along the seafront. In the summer all the Chiringuitos are open on the beach for long seafood lunches and later in the day you can enjoy drinks and dinner while watching the sun go down behind the headland. 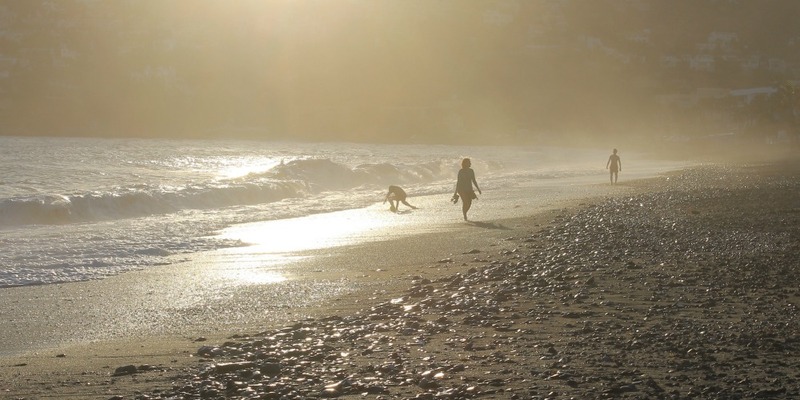 It’s a good destination for kids because the waters are calm and sheltered and the beach is clean and well maintained. There are also a number of playgrounds right on the beach with equipment for all ages. There are a limited number of reserved parking bays for guests directly in front of the hotel. You should call ahead to check availability. There is also plenty of on-street pay and display parking on the sea front (free at weekends, holidays and in the low-season) as well as free parking in the neighbouring streets. I am trying to come up with something useful to say here and can’t really find anything. I cannot fault the location, service and facilities. Of course, if you are a family looking for a hotel with a pool… well, you’ll be looking at other hotels. The general style of the hotel is fresh, contemporary and understated, which carries through to its facade. There are no flashy signs above the door and we did actually miss it on our first pass along the front. But this isn’t really a complaint, so I’ll stop scraping the barrel for one. Directions: Turn off N-340 coastal road. Turn left when you get down to the front. The hotel is down at the eastern end of the beach just before Restaurante Resbalaje which you will see on the beach to your right. Parking available on the beach front – either in the hotel’s reserved bays or in the pay and display areas marked in blue. La Caleta Bay definitely get’s our seal of approval, so if you do go there we wish you a lovely stay. And please do let us know if you found this review useful. Sophie is a freelance writer and founder of the GranadaSpain site. She spent seven years living in La Alpujarra, the Southern foothills of the Sierra Nevada, and is still a regular visitor to the area. In her previous lives she worked in event production and marketing in Hong Kong and London. She also blogs about motherhood and the funny side of life at bibsey.co.uk .